I was one of those girls who read The Diary of Anne Frank every year in junior high and early high school. When I was 18 and went to Amsterdam, I made a point to go visit the Anne Frank Huis, a four-story canal house, even though it wasn’t on my tour schedule. I’ll never forget the narrow, steep stairway behind a book shelf and the hiding place where Anne Frank’s family and other Jews hid, and the tall steeple of a church visible from a window. Anne went into hiding in July of 1942, shortly after her 13th birthday. After 25 months she and her family were discovered and sent to a concentration camp, and she died a few weeks before her camp was liberated. The idea of a hiding place and heroism — people brave enough to rescue and hide and save others from almost certain death in concentration camps because to them it is the right thing to do — impressed me. 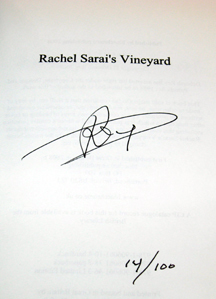 Thus I was delighted to get a signed, advanced copy of Deborah Rey‘s new book, Rachel Sarai’s Vineyard. It’s a memoir. The book is layered with another story, as well — the author’s private war in her own home. Deborah’s writing is honest, and she tells it raw, as it really was. Deborah was born in Amsterdam and lived in the same neighborhood as Anne Frank, she knew the Frank family, her half brother was in the same class at school as Anne. My path crossed Deborah’s through poet L. Ward Abel, and I read her manuscript when it was just a stack of papers. Now it’s a hardback book that I can hold in my hands and open and breathe in that characteristic new-book smell. 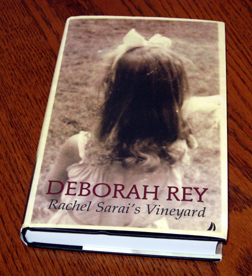 The book will officially be released in April, in time for Deborah’s 70th birthday. My best to Deborah on both milestones!